Open House this Sunday from 12 to 3 p.m. at 1332 Snowberry Lane, Louisville. LOUISVILLE – Heads up, new year home buyers. Local builder Markel Homes is going gangbusters at North End in Louisville. A variety of move-in-ready properties are available now, with more coming later this month and into spring. Each home upholds the Markel Homes brand of excellence in design, architectural styling and quality workmanship. The builder is known for building new communities in great locations. North End has been a home run. A beautiful, pristine, never-lived-in home signals a new beginning. Every room says “make me yours.” Open interiors allow for creativity in furniture arrangement, and gleaming hardwood floors and designer-chosen selections provide an enviable backdrop. Markel Homes equips their homes with an energy-saving Nest® thermostat, high-efficiency furnace and Energy Star® appliances. The builder uses durable building materials and sustainable construction practices to reduce the need for maintenance and conserve environmental resources. For the North End buyer, a new home is the entrée into a lifestyle characterized by peaceful walks through Hecla Lake Open Space, and coffee shops, eateries and a yoga studio just minutes from home. Peace of mind comes with knowing your kids are attending great schools. The summer Farmer’s Market and Louisville Street Faire foster a sense of belonging. Louisville is filled with healthy, active individuals and families who like living here and respect and care about their community. Directly across from protected open space in the southwest corner of North End sits Block 10, with homes that feature front-facing views of Hecla Lake and snow-capped mountain views from the back. The single-family homes at 2103 and 2107 Hecla Drive are steps away from the neighborhood walking path. Huge windows in the two-story living area at 2107 Hecla Drive look out to open space. The stunning east-facing master bedroom in 2103 Hecla Drive features morning views of Hecla Lake. Both properties boast Markel Homes’ brand of quality, style and good taste. Priced at $714,900 (2103 Hecla Drive) and $699,900 (2107 Hecla Drive), the homes are complete and move-in ready. HOA fees cover exterior maintenance, landscaping and snow removal for Markel Homes’ easy living properties. The easy living feature is especially attractive to buyers looking for a lock ‘n leave situation that accommodates hassle-free days or weeks away from home. Three duplex units on Snowberry Lane in Block 10 are ready this month in both single-story with a finished lower level and two-story plans. The homes feature contemporary styling in bold colors, open interiors, large windows for fabulous natural light and views, and flat as well as angled roof lines that create architectural interest. The single-story unit features the desirable main floor master suite with five-piece bath and large walk-in closet. Sliding glass doors in the dining area, large windows in the master suite and three walls of windows in the living area provide both physical and visual access to the patio. The hangout room, second and third bedrooms and second full bath are located in the finished and private lower level – ideal for guests or for use as a home office. The neighborhood walking path leads from the Block 10 duplexes to Hecla Lake Open Space. Trail access is a given, and the Main Street restaurants and shops are just minutes away. The contemporary two-story at 2111 Hecla Drive, priced at $709,900, features a main floor master suite, bright two-story living area and fabulous windows in every direction. A wall of side-facing windows brings soft natural light into the master suite. Bedrooms two and three are on the upper level with a loft, second full bath and deck. The two-story homes at 2119 and 2123 Hecla Drive are designed in newwest architectural styling, with open main floors, large windows and L-shaped kitchens anchored by a large rectangular island. 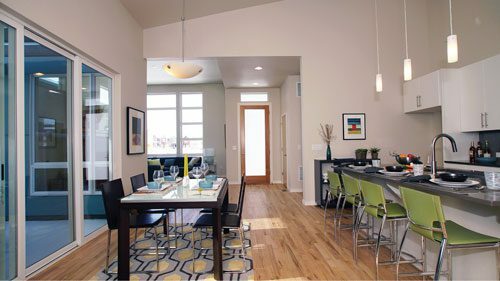 Both are 3-bed/2-1/2 bath plans. The home at 2119 Hecla Drive, priced at $699,900, features a main floor master suite, front patio and upper level deck. Highlights at 2123 Hecla Drive include the larger yard, main floor study and vaulted master bedroom, with pricing at $719,900. The staged duplex at 1332 Snowberry Lane, Louisville, will be open this Sunday, January 15, from 12 to 3 p.m.. The North End Sales Center, located at 1805 Blue Star Lane, is open daily from 11 a.m. to 5 p.m. (Tuesdays 2 to 5 p.m.). Stop by or contact sales manager Michele Steward by phone at 303.604.9196 or e-mail michele@markelhomes.com. Details about all of the Markel Homes properties at North End and the other Markel Homes communities are available at MarkelHomes.com.